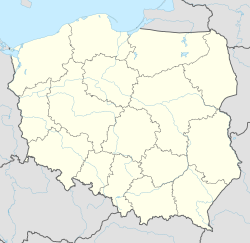 Międzyrzec Podlaski [mʲɛnˈd͡zɨʐɛt͡s pɔdˈlaskʲi] is a city in Biała Podlaska County, Lublin Voivodeship, Poland, with the population of 17,162 inhabitants as of 2006[update]. The total area of the city is 20.03 square kilometres (7.73 sq mi). Międzyrzec is located near the Krzna river, not far from the border with Belarus. The first official mention of Międzyrzec Podlaski as a town dates back to 1434, or (alternatively) 1455 and 1477 according to different historical sources. At that time, the newly established town was located along a busy merchant route from Lukow to Brzesc nad Bugiem. Międzyrzec quickly developed: in 1486, a Roman Catholic church was built here, and town’s owner, Jan Nassutowicz, received permission for fairs. In 1598, a salt warehouse was opened, the town also was center of beer industry. The period of peace and prosperity ended in 1648, when Miedzyrzec was raided by Zaporozhian Cossacks. During the Swedish invasion of Poland, the town was ransacked and burned by Swedes, who returned in 1706 and 1708, during the Great Northern War. Furthermore, Międzyrzec was raided by Russians in 1660. In 1795, following the Partitions of Poland, the town was annexed by the Habsburg Empire. From 1809 until 1815, it belonged to the Duchy of Warsaw, and after Napoleonic Wars to Congress Poland under the control of the Russian Tsar. In 1867 it became a stop on the Polish railway system. By that time, Miedzyrzec was an important center of Greek Catholic Church: in 1772, Duke August Aleksander Czartoryski founded here Unite Church of St. Peter and Paul. Since mid-19th century, government of Russian-controlled Congress Poland initiated the process of Russification, aimed at the Uniates. As a result, two local Uniate churches were turned into Orthodox (1875). Already since the 16th century Międzyrzec was home to a large Jewish community. At the end of the 1930s in the reborn Polish Republic approximately 12,000 inhabitants, or ¾ of its population, were Jewish. In 1939, during the Nazi–Soviet Invasion of Poland, the city was overrun by Wehrmacht on 13 September 1939, and ceded to the Russians on 25 September, in accordance with the Molotov–Ribbentrop Pact. Two weeks later, it was transferred back to Germany after the new Boundary Treaty. In 1940 six separate slave-labor camps were set up by the Nazis for some 2,000 local Jews; along with Judenrat, and the Jewish police. The German army entered the Soviet occupation zone on 22 June 1941 under the codename Operation Barbarossa. More Jews from the surrounding area including expellees from Kraków were shipped in. On 19 April 1942 the Jews were ordered by the Gestapo to turn over 50 kilograms (110 pounds) of gold within 3 days. Some 40 hostages were murdered on the streets. On 25–26 August 1942, the first mass deportation of Jews from Międzyrzec took place with around 10,000 prisoners forcibly put on 52 cattle cars (shipment #566 according to the German inventory) and sent to Treblinka extermination camp. Two days later, the Międzyrzec Podlaski Ghetto was established under the management of Judenrat. Several more mass deportation actions followed. On 17 July 1943, the ghetto was officially liquidated, along with the local transit camp. Fewer than 1% of the Jewish population of the city survived the Nazi mass executions and deportations to death camps. Of the approximately 4,900 employed citizens of the city, ca. 36% work in industrial fields, 19% in trade markets, and 11% in education. The unemployment rate in the city was 22% in October 2005. The town lies at the intersection of two important national roads: DK2 (Poland's main east-west connector) and DK19. In the future Expressway S19 will run just west of the town. A 6.6 km (4.10 mi) section of it already constructed as the town's bypass road and opened in 2008 allows north-south traffic on DK19 road to avoid the town centre. Międzyrzec Podlaski is referred to by various names in different languages including Yiddish: מעזריטש‎ Mezri'tsh, Latin: Meserici, Belarusian: Міжрэчча, German: Meseritz, Latvian: Meņdzižeca Podlaska, Lithuanian: Palenkės Mendzyžecas, and Ukrainian: Межиріччя. Not to be confused with Mezhirich or Mezhirichi. ^ "Międzyrzec Podlaski – Historia miejscowości". Virtual Shtetl Museum of the History of Polish Jews. Retrieved July 24, 2011. ^ "Ziemia międzyrzecka. Historia". Urząd Miasta Międzyrzec Podlaski. Archived from the original on February 2, 2008. Retrieved July 24, 2011. ^ a b c "Jewish heritage of Międzyrzec Podlaski". Association of Immigrants of Mezritch Depodalsia Area in Israel. Retrieved July 26, 2011. Wikimedia Commons has media related to Międzyrzec Podlaski.